How can you ensure that the water filling your bath is at a safe temperature, and avoid accidents for everyone using it? We asked bathroom merchant Big Bathroom Shop for some tips and advice. They told us that hot bath water causes serious harm to around 600 people each year as well as causing up to 20 deaths with injuries mostly occurring to very young children or the elderly. Most people, when filling a bath, will use too much hot water then top the bath up with cold water to get the temperature they want. However, when young children which are left unsupervised, or elderly bathers forget to add the cold water, accidents can occur. A domestic hot water system stores water at 55 degrees Celsius to prevent the growth of Legionella bacteria. At this temperature it can take as little as 30 seconds for skin to suffer third-degree burns. Installing a thermostatic mixing valve that blends hot and cold water to a safe temperature avoids the risk of scalding. A thermostatic mixing valve is installed underneath the bath to control the temperature of the water feed to the bath taps, leaving you with the freedom to choose from a wide variety of tap styles and achieve a stylish look. 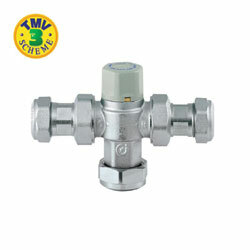 Under-bath thermostatic mixing valves are sometimes called anti-scald devices and have been accredited to TMV3 which is the standard for public buildings such as schools and hospitals. And they are also ideally suited for use in the home. So, how do they work? Inside the valve there is a thermostat which can be pre-set to control the blended water temperature – the recommended bathing temperature is 37-37.5 degrees Celsius and water from the hot bath tap should not be any higher than 46 degrees Celsius (however, it should be noted that this is not a safe bathing temperature). The valve also contains a temperature-sensitive element which expands or contracts depending on variation in the temperature of the water supply. It causes a sliding valve element to move, thus varying the supply of hot or cold water entering the mixing chamber of the valve. In case of the cold water supply failing the mixing valve will operate as a fail-safe device, causing the slide valve to close off the hot water supply completely. It is important that a thermostatic mixing valve is serviced once a year. So, if you would like to find out more about fitting a thermostatic mixing valve in your bathroom, where should you start? You can check out Big Bathroom Shop’s Ultra Under-Bath Thermostat TMV3 here. This retailer also operates a live chat service on its website, so you can get answers to any more questions you may have.